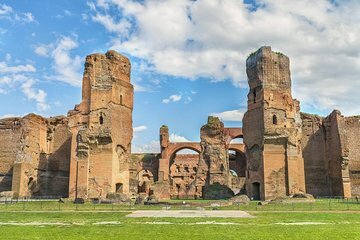 The Baths of Caracalla are widely considered among the most important ruins in Rome, but their secrets are hidden under thousands of years of history. With your private guide to lead the way, explore the baths and learn of life in Rome under rulers including Septimius Severus and Caracalla. Marvel at the baths’ ancient porticoes and vaulted rooms, and discover decorative mosaics among the historic ruins. Choose a 10am, 1pm, or 3 pm start, then make your way to the Baths of Caracalla in central Rome to meet your private guide and begin your tour. Constructed during the reigns of Septimius Severus and Caracalla, the baths were once among the largest of their kind in Rome. During your tour, explore the park area by the Colosseum and listen as your guide sheds light on life during the Roman Empire. Admire the domed octagons, porticoes, and vaulted rooms for which the baths are famous, and learn of the uses to which the spaces were put thousands of years ago. See parts of the baths’ heating system along with sections of decorative floor mosaics, and hear stories behind this impressive archaeological monument. When your time at the Baths of Caracalla comes to an end, step outside the complex to conclude your private tour. Well worth the money! Our tour guide was extremely knowledgeable and he even gave each of us an architectural map that helped to envision the baths as they once were during the glory days of the Roman empire. Without this tour, we wouldn't have understood the purpose of the various rooms within the baths, and we would have viewed the entire structure as simply more ruins. Highly recommend this tour! !